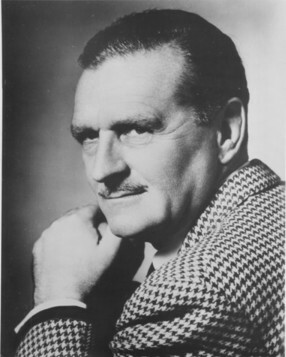 Above: A publicity portrait of James Craven. (Photo courtesy of Albert Leining). Tall and thin, with a suavely refined manner and a slight air of smug craftiness, James Craven was eminently qualified for playing two-faced serial “brains heavies.” He was handsome and dignified enough to believably pose as a respectable citizen, but shifty-looking enough to make his underhanded outlawry convincing to the audience. Craven’s villains were only intermittently suave for the first half of his serial career; in his earlier cliffhangers at Columbia Pictures he specialized in playing ill-tempered heavies whose frustration with their bungling henchmen frequently left them on the verge of apoplexy. In his later serials at Republic Pictures, however, he switched easily to playing calmer, more self-possessed villains, while still remaining just as assured and interesting a performer. I have very little information on James Craven’s early life and pre-Hollywood career, but thanks to Albert Leining (the nephew of Craven’s wife), I’ve gained several nuggets of valuable biographical info, the first being that James Craven was born James Meggs in Canada. Several Canadian newspaper articles from the 1930s have filled in a few more blanks for me; it would appear that Craven studied acting in a school attached to England’s Embassy Theatre (which opened in 1932), and by 1936 was appearing on the English stage under the auspices of the Croydon Repertory Theatre. 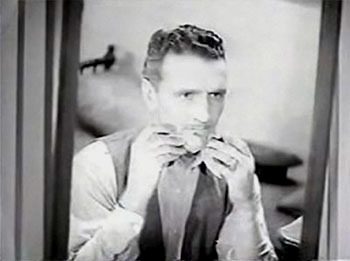 His movements become hazier during the latter half of the 1930s, but it seems logical to guess that he transitioned from the English stage to the American stage (probably spending some time in New York) and thence to Hollywood–where, in 1940, he made his screen debut in The Green Archer, a 1940 Columbia serial. Green Archer, a rather weakly-plotted crime serial, starred Victor Jory as insurance investigator Spike Holland, who was out to capture a gang of jewel thieves secretly led by the respectable Abel Bellamy (Craven). In the first chapter, Bellamy framed his brother for his own crimes in order to use the family castle as a headquarters for his gang. Bellamy then spent most of the remaining serial trying to get the pesky Holland off his trail; the villain was additionally frustrated by a mysterious masked archer who kept pulling Holland out of trouble. Archer’s storyline was thin, but director James W. Horne (who had made his mark in silent and sound comedies) extracted some entertainment from it by filling it with comedic scenes, most of them involving Craven and his henchmen. While Craven’s Bellamy began the serial as a conceited but calculating schemer, he became more and more hysterical as his schemes repeatedly failed, giving Craven plenty of chance to “ham it up.” His shrill bursts of rage and frenzied denunciations of his followers (“The fools! The idiots!”) were highly enjoyable, though decidedly atypical for a serial villain. 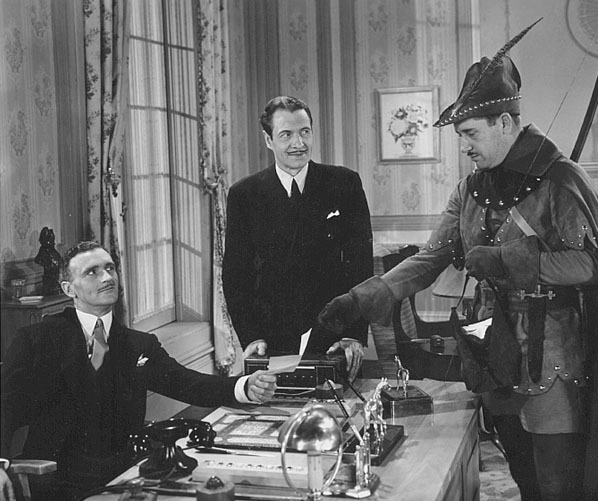 Above: James Craven (seated) plots with a phony Green Archer (Jack Ingram) and Robert Fiske (center) in The Green Archer (Columbia, 1940). 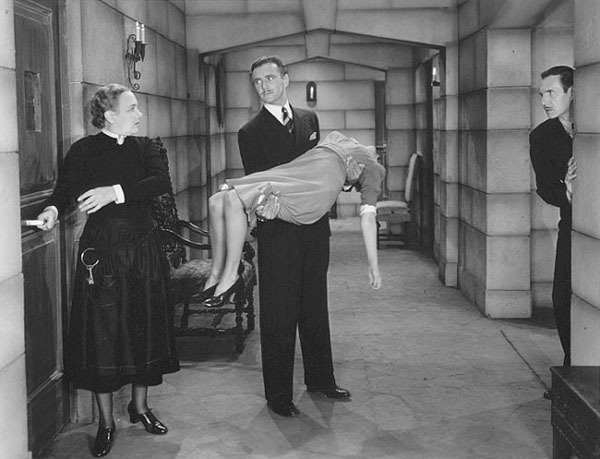 Above: James Craven carries Dorothy Fay to a secret dungeon in The Green Archer. That’s Mary McLaren at the door and Robert Fiske peering around the corner. White Eagle, Craven’s second serial, was released just two months after his first. This energetic but uneven Western cliffhanger, also directed by James Horne, featured Craven as “Dandy” Darnell, a frontier businessman determined to stir up an Indian war so he could grab some gold-rich Indian land. 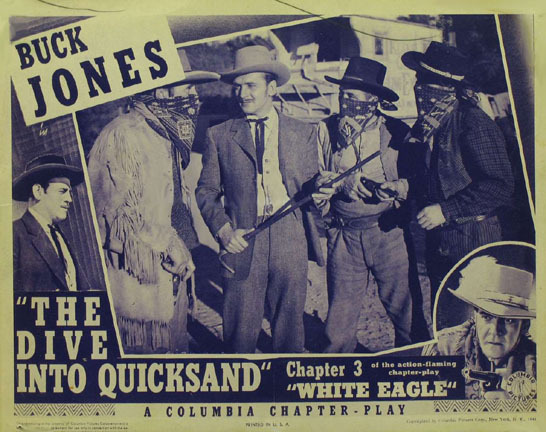 White Eagle (Buck Jones), a half-Indian scout, combated Darnell’s attempts to steal his tribe’s lands, much to the annoyance of the arrogant villain. White Eagle, like Green Archer, was largely played for laughs by director Horne, and Craven’s Darnell was just as outrageously short-fused as his Abel Bellamy had been. Darnell heaped amusing vituperation on his men, and was nearly as rude to the good guys who were attempting to expose him; he was seemingly unable to hold his temper in check even when diplomacy would have been more helpful. Above: James Craven (second from left) plots with three masked henchmen in this lobby card for White Eagle (Columbia, 1941). The masked man on the far left is Al Ferguson. Buck Jones is in the right-hand corner picture, and Roy Barcroft is on the left-hand border of the card. After playing a villain in the Monogram B-western Tumbledown Ranch in Arizona and filling several bit parts in bigger movies, Craven made his third and last Columbia cliffhanger, Captain Midnight, in 1942. Once again he was directed by James Horne, and once again he played an egotistical, easily-annoyed heavy–the “master spy” Ivan Shark. Shark, on behalf of an unnamed foreign power, was intent on stealing a plane-detecting device developed by an American scientist, but was continually thwarted by the masked Captain Midnight (Dave O’Brien). Captain Midnight was heavily tongue-in-cheek, despite the surface seriousness of its plot. 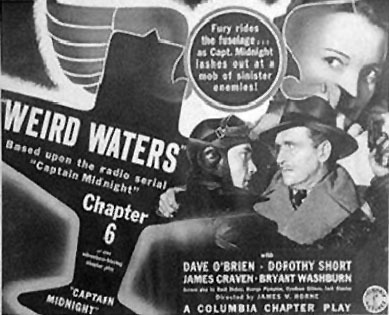 Craven, who had more screen time than star O’Brien, was hilarious as Shark, taking childish delight in his over-elaborate deathtraps and his mastery of disguise (“I’m so good I even fool myself!”), continually shouting at his henchmen and at Captain Midnight, and aggressively ignoring his continued failures. The cliffhanger felt more like a comic vehicle for Craven than anything else, and formed an appropriately offbeat finale to his offbeat serial career at Columbia. Above: James Craven as Ivan Shark dons one of his disguises in Captain Midnight (Columbia, 1942). Above: Dave O’Brien grapples with James Craven in this lobby card for Captain Midnight. Leading lady Dorothy Short is in the background. After his first three serials, Craven concentrated chiefly on feature-film work for several years, playing uncredited bits in major films (Fox’s Son of Fury, Warner Brothers’ Captains of the Clouds) and big roles in B-films (PRC’s Today I Hang, Universal’s Little Joe the Wrangler).. In 1942, Craven made his only Universal serial appearance in The Adventures of Smilin’ Jack. This wartime adventure serial utilized a new method for bringing viewers up-to-date on the action of preceding chapters; instead of narration or written recaps, two characters would discuss the previous chapter’s action at the beginning of each new installment. Craven, who appeared in three chapters as Commissioner Hardy (a British military official in Hong Kong), filled this narrative function in Chapters Six and Seven, following the heroes’ activities from his office and smoothly reviewing the plot with the help of fellow-official Herbert Heyes. 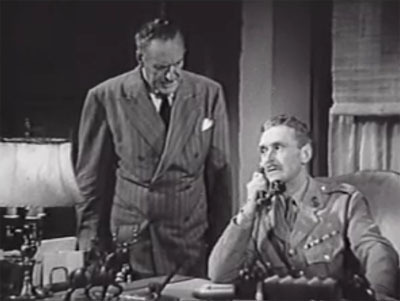 Above: Herbert Heyes watches as James Craven makes a phone call in Adventures of Smilin’ Jack (Universal, 1942). Craven’s screen career ceased abruptly in 1943 only to begin again in 1945, suggesting either that he returned to stage acting for a space or busied himself with some kind of wartime service. One of his first films following his reappearance in Hollywood was Republic’s exciting 1945 cliffhanger The Purple Monster Strikes. Crave began the serial as a good guy, a distinguished scientist who witnessed the landing of a Martian spaceship. Unfortunately for Layton, the spaceship’s occupant, the Purple Monster (Roy Barcroft) was the advance agent of a planned invasion of the Earth. The Monster killed Layton when the scientist naturally refused to countenance the Martian’s schemes, and then assumed his victim’s body by means of a Martian gas. The Monster used Layton’s identity as a cover for his plans, managing to deceive Layton’s niece (Linda Stirling) and hero Craig Foster (Dennis Moore) for much of the serial’s running time. 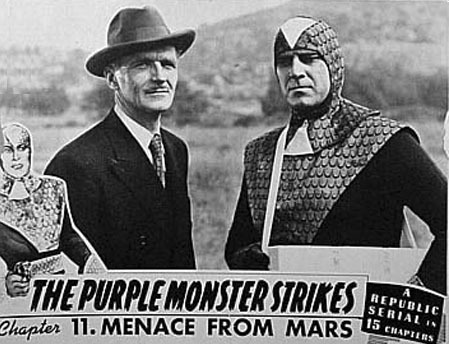 In Purple Monster, Craven, who approximately halved the serial’s villainous chores with Roy Barcroft, proved himself as skilled in subtlety as he had been in flamboyant “scenery-chewing.” He played the short-lived as Layton a lovably absent-minded scientific idealist, while as the transformed Purple Monster he was coldly intelligent and slickly hypocritical, showing no trace of the frenzied rage that had marked his Columbia villains. Above: James Craven and Roy Barcroft watch as Barcroft’s landing craft self-destructs in the first chapter of The Purple Monster Strikes (Republic, 1945). 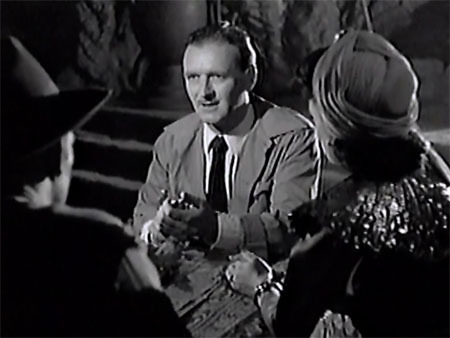 Above: James Craven (now playing the Purple Monster in the form of Dr. Layton) plots with henchman Bud Geary in The Purple Monster Strikes. For the remainder of the 1940s, Craven continued playing bit roles in big films and major villainous parts in B-westerns (among them Strange Gamble, the final Hopalong Cassidy feature). His next serial was Federal Agents vs. Underworld Inc. (Republic, 1948), in which he appeared very briefly in the first chapter, as an archeologist named James Clayton who was kidnapped by gangster Roy Barcroft. It seemed that Craven had stumbled onto the Golden Hands of Kurigal, keys to a fabulous Middle Eastern treasure that Barcroft’s boss (Carol Forman) coveted. Craven remained offscreen until Chapter Ten, when a surprised audience learned that his kidnapping was faked and that he was actually colluding with Barcroft and Forman in their scheme. With G-man hero Kirk Alyn hot on the villains’ trail, Craven tried to “play both ends against the middle,” planning to simultaneously rid himself of his partners, convince Alyn of his innocence, and gain the treasure of Kurigal. Federal Agents vs. Underworld Inc. was one of the most interesting and cleverly-plotted of Republic’s later cliffhangers, and Craven’s cool depiction of the sly, manipulative Professor Clayton almost stole the serial, despite his late re-entrance on the scene. Above: James Craven plots with Roy Barcroft and Carol Forman in Federal Agents vs. Underworld Inc. (Republic, 1948). In 1949, Craven made a very brief return to Columbia’s serials, receiving one or two lines and no billing in the role of a scientist named Norwood in Batman and Robin. Also in 1949, he played his only really prominent serial good guy, Professor Millard in Republic’s King of the Rocket Men. Millard was a member of a research group called Science Associates Inc., one of whose number secretly became the criminal “Dr. Vulcan” and began killing off his colleagues. Millard survived a murder attempt by Vulcan, but pretended to be dead so he could work in secret on devices to combat the mad scientist. The most important of these devices was a flying “rocket suit,” which Millard’s ally, Professor Jeff King (Tristram Coffin), used to turn himself into the heroic Rocket Man. Millard remained Rocket Man’s trusted ally, even donning the flying suit himself in one chapter, until he died heroically in Chapter Seven while trying to save the other protagonists from molten lava. Craven made Millard seem like a truly intelligent and noble character, convincingly discussing the serial’s science-fiction gadgetry and emphatically conveying his character’s devotion to the task of bringing down Dr. Vulcan. 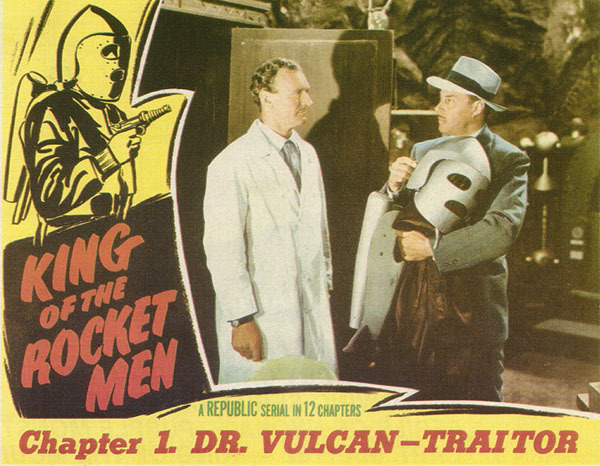 Above: James Craven hands over his perfected rocket suit to Tristram Coffin in King of the Rocket Men (Republic, 1949). 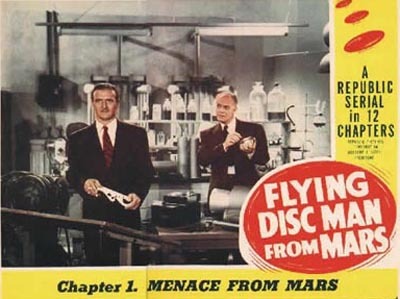 Craven’s final serial, Flying Disc Man From Mars, was released by Republic in 1950. Like Purple Monster Strikes, this derivative but entertaining cliffhanger dealt with a planned extraterrestrial invasion; this time the Martians’ advance agent was Mota (Gregory Gay). Craven played an aircraft manufacturer named Bryant, and was again the first Earthling to meet the Martian. However, this time Craven’s character was persuaded to join the Martians’ world conquest plot, after Mota threatened to reveal Bryant’s wartime activities as a Nazi collaborator and then promised him the job of Governor of Earth under Mars’ overlordship. In the end, however, the duo’s grandiose plans were defeated by pilot hero Walter Reed. Appropriately enough, Craven’s last cliffhanger role combined elements of his Columbia and Republic personas: Bryant, though much more slick and subdued than Dandy Darnell, Ivan Shark, or Abel Bellamy, was still reminiscent in some regards of these earlier heavies. Rather than relying on slyness to convince hero Reed that he was innocent of wrongdoing, Craven’s Bryant continually blustered and attempted to shout the hero’s suspicions down. He also tended to shout at his fellow conspirator Gregory Gay whenever things were getting difficult, only to react with pompous embarrassment when reassured by his cooler associate. 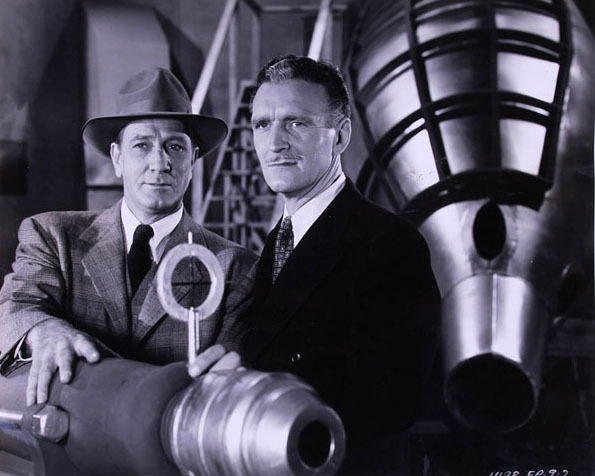 Above: James Craven and Gregory Gay in Flying Disc Man From Mars (Republic, 1950). 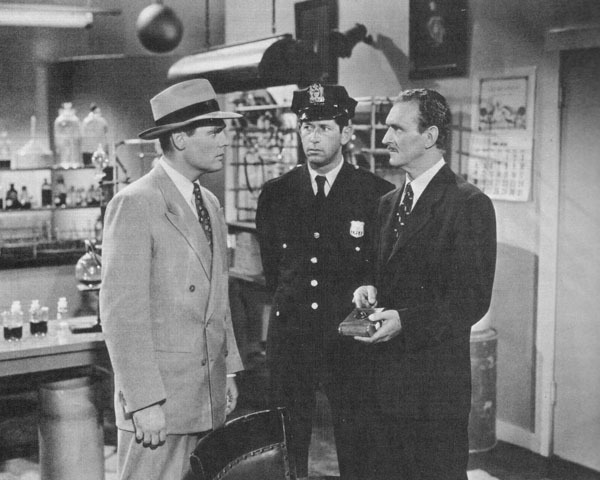 Above, from left to right: Walter Reed, Barry Brooks, and James Craven in Flying Disc Man From Mars. Craven is about to angrily order Reed out of his laboratory. In the 1950s, Craven continued as a bit player in films, while making many substantial guest appearances in early Western/adventure TV series like The Gene Autry Show, The Adventures of Kit Carson, The Lone Ranger, and The Adventures of Superman, almost always as a heavy. His final screen appearance was in the George Sanders feature Death of a Scoundrel in 1956; after which he returned to New York, possibly to resume his stage acting career (the Internet Broadway Database credits a James Craven with a role in a 1961 play). Albert Leining recalls that Craven met his future wife (and Albert’s aunt) Blanche Leining in New York in the 1950s, and that the couple moved to California shortly after their marriage–only to move East again (to Connecticut) in a few years’ time. Although the Internet Movie Database lists 1955 as the date of Craven’s death, this is an obvious error. Mr. Leining remembers his uncle as being alive as late as the 1970s, while Walter J. Noyes, who worked for Craven and his wife as a youngster, recalls Craven as living in Old Lyme, Connecticut, from at least 1966 through the early 1970s. I have not unearthed any further data on Craven’s later years, except for Mr. Leining’s reminiscence that his uncle ultimately moved back to Canada when his health began to fail; presumably, he passed away there. James Craven, though a strong performer with considerable screen presence, was never really able to showcase his talent on any cinematic screen but that of the Saturday matinee. However, the viewers of his serials and B-westerns definitely appreciated his scene-stealing villainous performances, whether he was insanely raving about unforeseen setbacks or cunningly plotting evil deeds. Cool or crazy, James Craven was always worth watching. 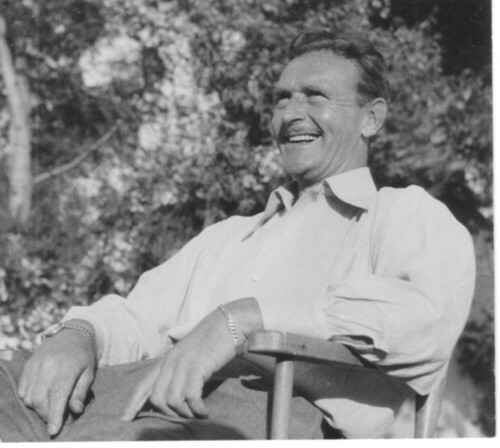 Above: A family photo (courtesy of Albert Leining) of James Craven, with an ear-to-ear grin that you’d rarely see Craven flashing in one of his on-screen roles. The picture’s date is unknown, though I’d probably put it around 1950. 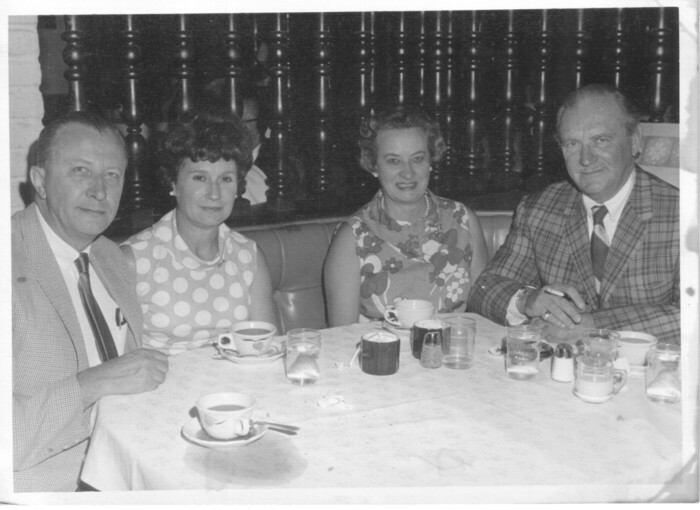 Above: A family photo (again courtesy of Albert Leining) of James Craven (far right) with his wife Blanche (second from right) and his in-laws Dr. and Mrs. Albert Leining. Date unknown, but judging by Mr. Craven’s appearance, it was taken several years after his retirement from films. Acknowledgements: My special thanks to Albert Leining for providing valuable and previously unknown information about his uncle, James Craven, and for the photos he kindly allowed me to utilize. My special thanks also to Walter J. Noyes for providing me with further information on Craven’s later years (see his comments and reminiscences below). Articles in the January 4th, 1936 (“The London Theatre”), and May 9th, 1936 (“Canadian Plays Lead”) editions of the Montreal Gazette gave me the additional information about Craven’s British theatrical activities. Mr. Craven’s performance in The Green Archer was really wonderful. I used to work for James Craven ( Meggs ) and his wife Blanche Ross the former wife of Dr. Rev. Ross deceased at that time; ( A minister at the Lyme, Congregational Church. ) on Sill Lane, in Old Lyme, Connecticut. Craven was alive in 1966 through the early 70’s. I remember as a young person sitting in his chair watching him on his colored television playing a heavy role in the Superman series from the 1950’s in his den, with photo’s of all the performances on the walls he was in during his career. A colored television was a treat to watch then. They had a beautiful big white stuccoed house with a three car garage. James Craven was a nice man with a great sense of humor. I especially enjoyed his English accent. Thank you very much for that additional information, Mr. Noyes; I will add it into the article. Any additional recollections would be appreciated by both me, and, I’m sure, my readers, if you happen to have them. Thanks again.